LOS CABOS, Mexico — Before entering the annual Bisbee’s Black & Blue Marlin Tournament Oct. 23-27, the biggest fish Dave Sanchez had ever caught was a largemouth bass near his home in Kansas City, Mo. His first marlin — a 465-pound blue, landed Oct. 25 off Cabo San Lucas — was respectable, but not exceptionally large by normal Black & Blue standards. However, it happened to be the only qualifying marlin weighed during the 32nd annual tournament, and that is noteworthy. 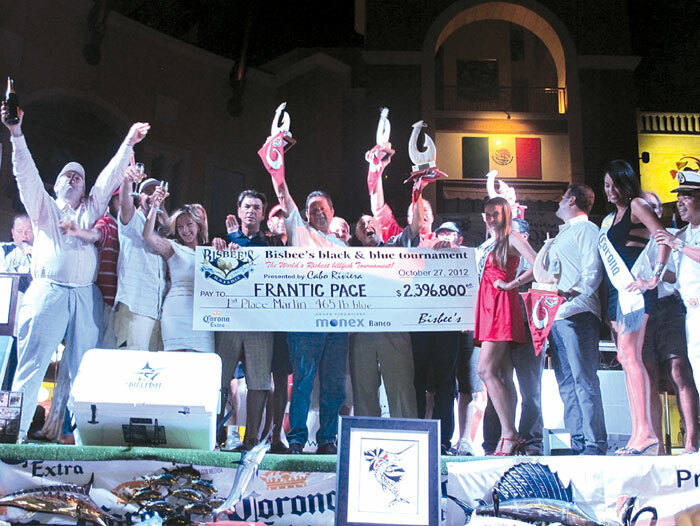 Since Sanchez and his team members aboard Frantic Pace were entered across the board in all cash prize categories, they are taking home $2.396 million for their fish. That payout is the second largest for a single team in Bisbee’s tournament history. A total of $2.475 million was up for grabs in 2012. Frantic Pace came within one-quarter inch of losing its record payout. That’s because the snap swivel connecting the reel’s main line to the lure leader opened during the fight. When mate Josh Temple realized the predicament, he gently leadered the fish to the boat before Tony Berkowitz planted the gaff. Once the marlin was aboard the 53-foot Pacemaker sportfisher, the crew realized how close they were to disaster. The only thing holding the lure leader was the quarter-inch bend at the end of the snap. Capt. Hercules “Herk” Marsella of Coral Springs, Fla. was at the helm for the lucrative catch. Since no other marlin weighing more than the 300-pound minimum was recorded during the three days of fishing, Frantic Pace swept all the major cash awards, including Top Tournament, Top Jackpot, Top Captain and all Daily Jackpot levels. More than 740 anglers aboard 106 boats competed in the 2012 event. The stakes are high in the richest sportfishing tournament in the world. The potential million-dollar prizes attract top anglers and crews from more than a dozen countries to the tip of the Baja peninsula. The largest Black & Blue payout for a single team was $3.9 million in 2006. Frantic Pace now adds its name to the record book. The Release Division payout came down to minutes this year, as all the top teams released a single blue marlin. Sea Angel — another new team to the Black & Blue tourney, fishing aboard a 63 F&S with Capt. Billy Angel at the wheel — won first place based on time of release. That catch earned a check for $50,830. Sneak Attack, a 65-foot American Custom yacht skippered by Capt. Sammy Talbert, came in second to win $17,595; while Hammertime, a 68-foot Hatteras run by Capt. Jeff Richardson, won $9,775 for third place. ← Fast Amphibious PWC/ATV Set to Go on Sale in U.S.